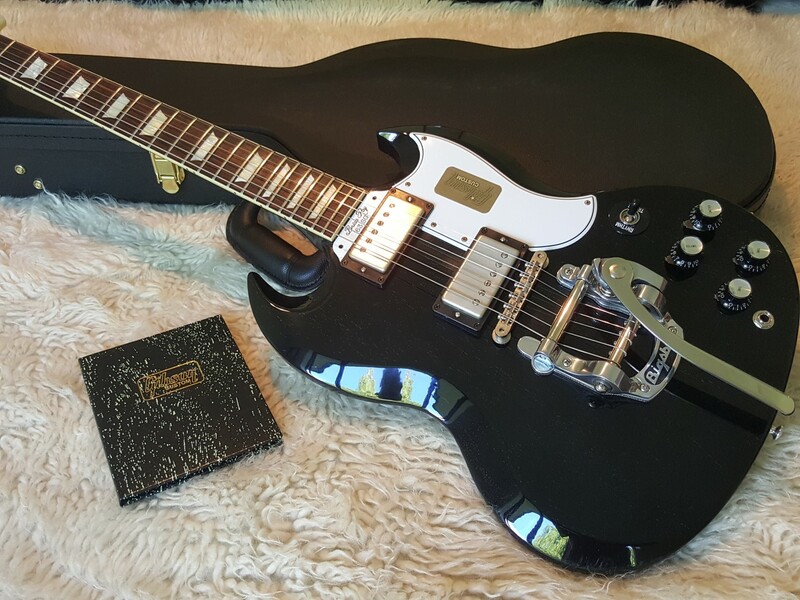 Brand New Gibson Brian Ray Custom Shop '63 SG Standard - Silver Fox. Genuine made in USA. Not been a demo in a store, 100% mint. Manufactured 30th Dec 2015. Thick, Resonant Rock 'n' Roll Tone! The Gibson Custom Brian Ray '63 SG solidbody electric guitar gives you the thick, resonant rock 'n' roll tone you crave. Loaded with a '57 Classic humbucker at its bridge and a Burstbucker 1 at its neck, the versatile Brian Ray '63 SG injects your playing with everything from plucky chime to rich, punchy lows. On top of that, the Brian Ray '63 SG's Bigsby B5 tailpiece with Vibramate converts from a stopbar to a tremolo, further adding to this remarkable guitar's flexibility. Gibson's Historic Bumblebee capacitor sets and hardwired harnesses add a sweet, vintage subtlety to the guitar's sound. Sporting a '57 Classic humbucker at its bridge and a Burstbucker 1 at its neck, the Gibson Custom Brian Ray '63 SG is a versatile tone machine. The Burstbucker will imbue your playing with phenomenally tight low end, complex midrange, and sweet highs that are complemented perfectly by the '57 Classic's warm, full tone and balanced response. The result is classic Gibson Custom vibe with all of the vintage PAF-like humbucker crunch you can handle! Gibson Hardshell Case and Certificate of Authenticity.